Lock in a great price for Infinity Exclusive City Hotel – rated 9.2 by recent guests! The service provided by the reception is perfect, they are very patient with us, and help us without hesitation. The staff were so great from the moment we arrived. They upgraded our room on the last night to a room with a jacuzzi room. The best were so comfortable and room was very clean. The breakfast was delicious! Perfect location. Walk to everything. Good breakfast. Marvelous staff. 24 hour tea and coffee. Arranged airport transfer at 5am! Very Good location. Reception staffs are very cooperative. I saw they are helping guest by translating conversation through google translation which requires patience and dedication to help others. Restaurent staffs were offering guests some pack snacks during their checkout. Hotel arranged my para gliding allowed me to checkout lately on my request. I recommend to stay here. Room was perfect. The breakfast was spot on, the hotel itself was very cosy and pleasing on the eyes in terms of the general theme of the hotel. We enjoyed our stay throughout. We were happy to be greeted by friendly staff and the room upgrade was a surprise. The room they have given us was really big and it had a jacuzzi in the corner which was my first experience alike. We only had one breakfast there, but our hosts were super kind which made our morning warmer. The breakfast was great and the waitresses were so joyous! The hotel is top clean and the diamond room with jacuzzi's are a splendor! The position of the hotel make it a great place to stay in!! The breakfast was very impressive. Lots of options and good quality food. The staff at the reception and breakfast were very helpful and accommodating. The location is very good, close to the marina and city center. One of our top picks in Fethiye.Located in the town center of Fethiye, within a walking distance from the sea, Infinity Exclusive Hotel is on a lively street surrounded by numerous bars and restaurants. It offers guestrooms with a balcony and free WiFi throughout. 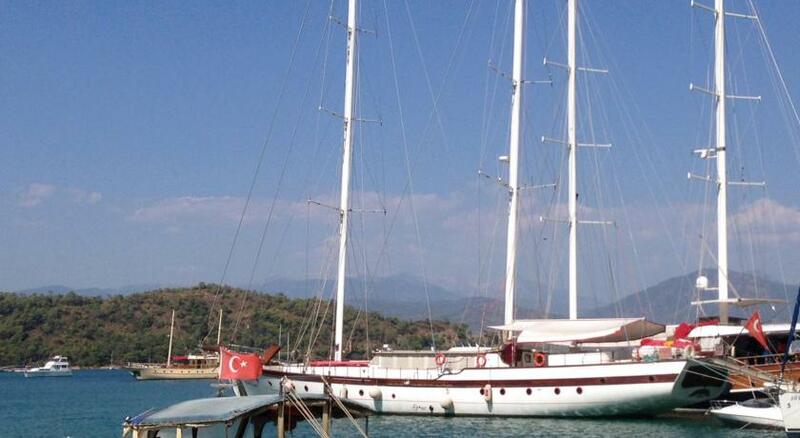 Fethiye Marina is just a few steps away. Simply decorated and air-conditioned rooms at Hotel Infinity Boutique feature a flat-screen TV and a mini-bar. A safety deposit box and a work desk are standard. The private bathrooms come with a shower, hairdryer and free toiletries. You can have your breakfast served to your room and light snacks are served during the day. A variety of restaurants offering local and international dining are within walking distance. Access to the 400-year-old Turkish Hammam, 50 feet away. Paragliding is very popular in this area. Babadag where you can do paragliding is only 50-minute drive from Infitinity Exclusive City Hotel. Famous Lycian Trail Way is 11 mi away. Calis Beach is 4.3 mi from the property while Butterfly Valley is 13 mi away. The staff, available 24 hours a day, assists with car rentals and offers ironing services. Airport shuttle services are arranged at an additional fee. Dalaman Airport is within 34 mi of the property. When would you like to stay at Infinity Exclusive City Hotel? House Rules Infinity Exclusive City Hotel takes special requests – add in the next step! Debit card Infinity Exclusive City Hotel accepts these cards and reserves the right to temporarily hold an amount prior to arrival. Infinity Exclusive City Hotel accepts these cards and reserves the right to temporarily hold an amount prior to arrival. Room was small and does not have a view. Excellent location. Very friendly staff especially the reception staff. Breakfast had a variety of food. Coffee was available all day. Room was clean although it was a little bit small. The location, helpfulness of staff and great variety offered for breakfast. Owner greeting guests at breakfast and organised a cake/candles to mark a guests' birthday. It was very pleasant and clean. There is a club next door which makes some noise. Other than that we really enjoyed our stay. What struck me most was that the whole team are just so friendly, warm and hospitable (literally everyone - the breakfast team of ladies, the cleaners and front desk) - fantastic service and it really made me feel at home. Also the hotel has a lift, great wifi, clean comfy rooms with immediate hot shower. Location is city center easy to reach everything. And the breakfast is fabulous! We love everything here. Facility and location is excellence. Hotel staffs are very helpful on our car technical issue. We will recommend our friends stay at this hotel. Very good location, and perfect staff. The staff really helps us much( order taxi, check bus timetable). By the way, the breakfast is also nice! Every thing and in particular the location. A rather pleasent stay in this extremely well located hotel. An ample and wonderfully styled traditional family room. Very friendly and professional staff who promptly answered every single request. An excellent tour has been arranged to the surrounding areas with plenty of time in the outstanding historical attractions of the region. The transfer from , and to, the airport has been arranged by the hotel with a pleasent driver who is fluent in English and has provided wealth of informations with respect to this region of Turkey. Finally, special thanks to go to the hotel manger and the lovely breakfast ladies for all their efforts to make our stay an exceptional one. Walls are thin and floors are tile, so it can be a bit noisy. Room was clean and well maintained, location of the hotel was great as public transport was available nearby. Breakfast was good.